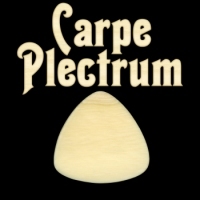 “Seize the Pick” says the Latin motto in ivory font above a gorgeous-grained ivory pick. Now you may seize upon this great music-inspired gift idea for that guitarist or mandolinist in your life! Get this design on a t-shirt, hoody, mug, bag, Ipad case or or other great item today, exclusively from GearGems!